Miami Dolphins QB Ryan Tannehill finished Sunday's contest against the New England Patriots 25 of 37 for 312 yards with 3 TDs and no interceptions. MIAMI GARDENS, Fla. — The Miami Dolphins not only snapped a seven-game losing streak in the series against New England on Sunday, they did it in Patriots’ fashion. Ryan Tannehill connected with Marcus Thigpen on a 14-yard touchdown pass play with 1:15 left to give Miami a come-from-behind 24-20 win against New England at Sun Life Stadium. The verdict wasn’t decided until safety Michael Thomas’ end-zone interception on Tom Brady’s pass from the Miami 14 with :02 on the clock. Thomas was signed off the 49ers practice squad during the week. By late Monday night, the Dolphins (8-6) could be in control of their playoff hopes after winning a third straight game and fourth in five. That’s because Baltimore (7-6), which owns a tiebreaker over Miami, plays at Detroit (7-6) on Monday night. A Ravens’ loss would mean the Dolphins would have a game lead in the race for the AFC’s final wild-card spot. Miami will play at last-place Buffalo next week before and finishing the season at home against the New York Jets. Here are a few observations from Miami’s victory against the Patriots. 1. Credit Joe Philbin with some gutsy decisions. With Miami trailing 20-17 and facing a fourth-and-5 on its own 45 and little more than three minutes remaining, Philbin decided to go for it despite the still having three timeouts. Tannehill hit Charles Clay for a first-down pass play that kept the game-wining drive alive. Earlier, on New England’s TD drive late in the first half, Philbin called two timeouts to save time for his offense. Miami got back the ball 1:38 before halftime. That helped Tannehill hit Mike Wallace on a post pattern for a 39-yard scoring play that made the halftime score 10-7. 2. Ryan Tannehill made like Tom Brady. Not only did Tannehill hit Wallace on the aforementioned TD late in the first half, the second-year QB directed the game-winning drive after Brady and the Patriots had gone ahead 20-7 on Julian Edelman’s 24-yard TD reception. The fourth-down pass to Clay obviously was pivotal, but Tannehill was 6 of 8 on the winning drive, which ended with Thigpen’s TD catch. 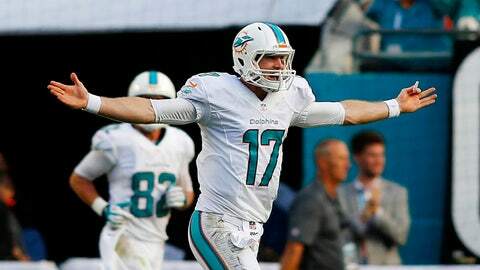 Tannehill ended 25 of 37 for 312 yards, 3 TDs and no interceptions! His QB rating was 120.6, compared to Brady’s 85.7. 3. Miami’s banged up secondary stepped up. Rookie cornerback Will Davis and second-year safety Michael Thomas saw late-game action following injuries to starting corners Brent Grimes and Nolan Carroll. Safety Jimmy Wilson also saw action at nickel back and corner. Thomas made two crucial plays. He denied Danny Amendola by knocking away the ball on what would have been a TD catch on New England’s final drive. The defensive back then intercepted Brady to clinch the win for Miami. 4. Tannehill spread the wealth in the passing game. Ten different Dolphins had receptions, led by Mike Wallace (6 catches, 105 yards, TD). Brian Hartline, who had no catches in the first half, finished with 5 receptions for 70 yards. Rishard Matthews also had 5 catches for 64 yards. 5. Miami avoided having a costly bonehead play. Late in the second quarter, the Dolphins lined up for a field-goal attempt to try and tie the score at 3. Center John Denney snapped the ball, which hit holder Brandon Fields in the facemask and bounced away. Field was looking at kicker Caleb Sturgis at the time. New England’s Nate Ebner recovered the ball the Patriots’ 31.